If cities don't plan for the coming energy crisis, many will not survive it. Part I of this series made the case for oil peak production some time between now and, say a decade from now. Part II examined the likely candidates to replace oil, concluding that none possess oil's density, portability, and versatility. Part III begins the process of examining what cities can do to prepare for oil scarcity. The calculus of the oil economy is relatively simple: if the oil infrastructure can continue bringing oil to market fast enough to meet market demand, then the economy will continue to tick along as it has. If, however, the rate of oil production maxes out but demand keeps growing, then the price of oil will keep rising until it gets high enough to push demand down to what the industry can provide. So far, the oil industry is still putting out, and market demand is still growing. In fact, part of the recent jolt in oil prices has been due to a lack of refining capacity, not a shortage coming out of the ground. However, it does appear that the oil industry is at or approaching an absolute limit to the rate at which it can produce oil (see sidebar: Are We In Peak Oil Today?). In any case, oil prices are nowhere near high enough to make a serious dent in global demand. Demand growth has slowed this year, but demand is still growing, especially in China. Although China consumes much less oil than America, its growth rate is much higher. At current trends, China will surpass America as the world's biggest oil consumer by 2023 (see sidebar: A Strangling Embrace). Barring some major disruption to the oil supply, prices will probably fall over the next three weeks as the summer "driving season" winds down and demand for gasoline eases temporarily. However, even as the cyclical aggravator fades, the underlying supply constraint will come back to haunt prices every time either demand cycles up toward the production limit or an unexpected event disrupts even a small percentage of total production. The economy is still growing, and demand for oil is still going to be higher this year than it was last year. Next year, when global demand has risen another two percent, the strain on our oil infrastructure will be that much worse. Blinkered analysts will insist again the the problem is cyclical, not systematic, failing to see the emerging pattern. US consumer spending has been growing faster than income for some years. This cannot continue forever. Inflation is starting to return to the US economy due to the rising price of energy. The US Federal Reserve has been increasing the prime rate slowly but steadily this year, and this will soon eat into consumers' ability to keep borrowing as credit card, home equity lines of credit, and adjustable rate mortgage payments go up. Much of the boom is related to the US housing market, which shows every sign of being in a serious bubble. Banks are already resorting to negative amortization packages and mortgages to illegal aliens to keep people buying, which smacks of desperation. This summer's blip in US auto sales is due only to deep discounts that the automakers won't be able to maintain for long. The big three are in deep financial trouble and remain profitable only in their finance divisions. Overall, sales of SUVs have stagnated and resale values are falling as drivers try to unload their gas-guzzlers. The US economy is still growing, but growth is slowing in response to both rising interest rates and rising oil prices. Consumers are accustomed to "feeling rich" and living on credit, which has eroded personal savings. The consumer savings rate is zero, down from ten percent in 1982. Refineries are running full-bore and straining their antiquated machinery to the limit. Unscheduled shutdowns have already brought the airline industry to the brink of jet fuel shortages. Saudi Arabia is at grave risk of both a collapse in the output of the legendary Ghawar oilfield and a major terrorist attack. Either event will send a shock through oil markets. Seasonal hurricane risks are still a potential disruption. Even if a major disruption doesn't occur, supplies will become increasingly constrained from one year to the next, until the year arrives when production simply cannot meet demand growth any more. I've already written a little on what individuals can do to insulate themselves from energy scarcity, but what can cities do to prepare for coming scarcity? Seventy percent of the oil consumed in North America is used for transportation, mostly on our surface network of roads, highways, and private automobiles. The other thirty percent goes into plastics, asphalt, and other miscellaneous uses. It will not be possible to go on using oil this way, which means by extension that it will not be possible to go on using cars as our main transportation mode. Hybrid cars will not save our road network as the global oil supply continues to decline. Nor will hydrogen-powered hypercars or biodiesel cars (biodiesel is actually a net energy sink, since more fossil fuel energy goes into growing the feedstock than the biodiesel produces). Most of these will probably continue in some form or another in increasingly narrow niches. No single fuel system can replace our continent-wide, internal combustion, gas-powered engine system. Even if a breakthrough was made in battery technology and cars could all shift to electric power, there will not be enough electricity to power our lights, appliances, gadgets, and vehicles. No matter what we do, we will end up with a patchwork of incompatible systems and fuel sources at much higher unit costs. The car will lose a lot of its lustre as a mass transportation vehicle in that case. First of all, stop investing tens or hundreds of millions of new dollars into expanding highway infrastructure. Instead, develop light rail systems for intra-urban transportation between distant points in the city. Transform existing highways into rail lines. Governments will still own the rights-of-way, and trains are ten times more efficient than vehicles for transporting people and goods long distances. Share city streets for pedestrians, cyclists, skateboarders, etc., as well as cars. Transportation and land-use are intricately connected. It's not enough to change the streets themselves; cities must also change the building patterns that streets serve. A year and a half ago, in an op-ed for the Hamilton Spectator, I wrote of the suburbs, "First, we must stop the hemorrhaging." This is even more true in the context of energy depletion. Sprawl simultaneously forces car-based transportation and destroys local farmland. Low-density, use-segregated building guarantees that people will live far from the amenities and services they need to live. Without local groceries, corner stores, etc., residents have no choice but to drive to distant supermarkets. Public transit is not viable in sprawl, because the population density is too low to make buses or light rail cost-effective. There are literally not enough people living within walking distance of a transit line to justify the cost. Throw out their zoning regulations that encourage sprawl, like use separation, deep set-backs, parking requirements, etc. Change building codes to require more energy efficient building design (see below). Draw firm urban boundaries. Instead of subsidizing developers who build on farmland, cities must encourage developers to build on brownfields, restore old buildings, and allow different uses to coexist. This brings prople closer to their destinations and reduces the need for both private and public transportation. Eliminate hidden "free" parking regulations and other subsidies that encourage people to drive even short distances. Calm traffic by making streets two-way, lowering speed limits, adding bike lanes, widening sidewalks, etc. This discourages driving and makes it easier for people to choose different modes. Ban drive-thrus and other building models that force the primacy of driving. Invest in public transportation options like light rail systems, which are more energy efficient than buses. We need to build new houses with efficiency in mind. It absolutely boggles the mind that robust and practical conservation targets haven't been standardized in our building codes. There's simply no reason for continuing to build houses with inefficient hot water tanks and forced-air furnaces. Instead, new houses should include pilotless on-demand water heaters and radiant floor heating at the very least. Europe has built this way for years, and they reduce energy demand by over a half. Instead, North American builders continue to follow the tried-and-untrue practice of assuming energy costs don't matter. Canadian natural gas production will peak in 2010, after which conventional gas will become progressively scarcer. Even if we manage to build an infrastructure of liquefied natural gas (LNG) shipping from offshore and other continents, gas will be much more expensive and subject to supply interruptions than it is now. 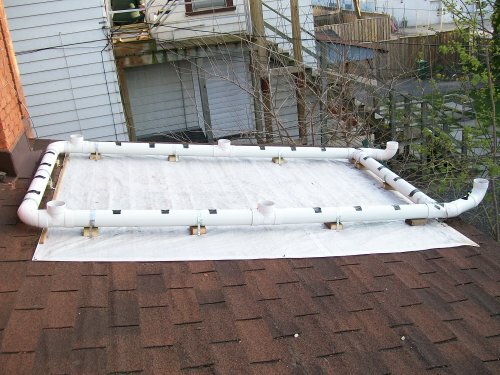 Active solar heating, in which roof panels collect solar energy to heat water, is still quite expensive and inefficient, but passive solar heating, in which the house is built with large, south-facing windows and materials that absorb heat throughout the day and release it slowly at night. In summer months, the house is kept cool with shading, ventilation, wing walls (which catch natural breezes), house fans, and thermal chimneys. 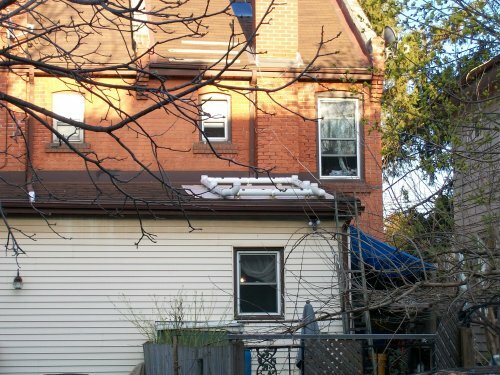 It is expensive to retrofit existing houses to improve their passive solar design (and governments should be providing incentives for homeowners and landlords to improve energy efficiency instead of providing incentives for developers to build more sprawling subdivisions), but there's no excuse not to build new houses this way, especially in urban in-fill projects. City residential lots tend to be taller and narrower, squeezing more houses into a smaller area. This has numerous benefits over the more horizontal suburban model, from higher population density and better street life and neighbour interaction to improved energy efficiency through the "huddle effect" of crowding the houses together. The means to build much better houses exists, but the political will is too often lacking. Given encouragement, efficient building can flourish. In 2000, the City of Chicago's Department of Environment and Department of Housing sponsored a competition to build an affordable green house. One of the finalists was Esherick Homsey Dodge & Davis entry Factor 10, a 1,200 square foot, two-story house on an urban lot that uses only one tenth the energy of a conventional house. Starting with a thermal foundation and super-insulated walls, Factor 10 also includes a whole house fan for cooling and solar chimney that pushes warm air into the house during winter. It also has a green roof of sedum to absorb heat and insulate the roof, an array of sealed water bottles on the north side that act as a heat sink, and an open, cross-ventilated floor plan. Plumbing is all low-flow, with dual-flush toilets. The house was designed as part of the city's affordable housing project, so it was designed to be comparable in price to conventionally built houses. Again, there's no reason why every new house cannot be built to similar standards of efficiency. Rather than scrambling to secure new sources of energy, we could be making much better use of our existing sources and saving plenty of money. The electricity grid will also be increasingly strained in the coming decades. Natural gas fired power plants provide much of North America's electricity, but Canadian natural gas production will peak around 2010, after which the growing shortfall will have to be supplied elsewhere. Over the past fifteen years, the United States bet the farm on natural gas, using it directly for heating and indirectly for producing electricity. Ten years go, the consensus view was that natural gas supplies were adequate to last decades. Since then, demand has surged at unprecedented rates, and America's reserves abruptly peaked. Canada will peak soon, and Mexico doesn't have as much gas as analysts had predicted. That spells trouble over the medium term. Right now, half of Canada's natural gas is being exported to the United States. According to the North American Free Trade Agreement (NAFTA), Canada is not allowed to reduce its natural gas exports without also reducing its own domestic use, guaranteeing the the US will continue to have premium access to Canadian gas, despite the fact that the US government still refuses to accept the recent unanimous ruling of the NAFTA arbitration panel that it must lift countervailing duties against incoming Canadian softwood and pay back $5 billion in unfair penalties against Canadian lumber exporters. As a result, we can expect increasing pressure to build more coal-fired and nuclear power plants to make up the shortfall from declining domestic natural gas. Both options come with serious problems. Coal is cheap and abundant but dirty, and a significant increase in the number of coal-fired power plants contribute to air quality problems, anthropocentric climate change, and toxic, even radioactive, waste. The so-called "scrubbers" touted by the coal lobby only reduce air pollution, and they do so at the expense of energy productivity. As energy scarcity escalates, the pressure will be on to exempt power plants from air quality regulations. Nuclear power, by contrast, is colossally expensive, and the cost will only increase as high quality fuel is depleted and the fuel costs of mining, refining, and transporting nuclear fuel, not to mention building nuclear power plants, go up. The total ERoEI of nuclear power, accounting for plant construction, monitoring and safety, and decommissioning, is actually quite poor. Nuclear power may, however, enjoy massive subsidies from governments desperate to appear decisive in meeting the public's demand for abundant energy. Wind turbines have an important role to play, as the cost per kilowatt hour is becoming increasingly competitive. With smart investments now, Canada may one day generate a significant share of its electricity through renewable wind power. Bear in mind also that constructing wind turbines requires the use of oil, so our ability to construct renewable energy infrastructure in the future will be constrained even as our current energy infrastructure declines. Encourage conservation. The easiest way to "produce" more electricity is to use less. Ontario's electricity deregulation scheme of the 1990s was supposed to accomplish this, but consumption continues to increase (see sidebar: Electricity Deregulation). The government's planned "smart meters" should help considerably, since they charge residents variable rates per kilowatt-hour depending on time of day. This will encourage people to move non-essential activities, like laundry and dish washing, to off-peak hours. This way, the grid can get away with a lower peak capacity. Similarly, renters who currently pay all-inclusive bills should be billed separately for energy. A recent study found that apartment buildings which split energy bills out of rent saw consumption go down by a third. For every three apartment buildings that do this, enough energy will be conserved to power a fourth building. Encourage intertie production. Buildings that generate their own power can tie it back into the grid. If a building produces more electricity than it uses, then the meter runs backward and the power company pays the producer. To be honest, none of these recommendations will prevent the severe disruptions and dislocations that will accompany post-peak oil production. At best, they may provide a way for cities to cushion the blow and reduce economic and social exposure to the energy crisis. The biggest obstacle to energy independence is the massive proliferation of sprawl: low-density, use-separated development far from the centre of town, often on prime farmland. The loss of the best land means cities are more dependent on poorer quality farmland that not only needs big inputs of petroleum based fertilizers, pesticides, and irrigation, but also is more susceptible to crop failure due to changing climate. At the same time, the built environment is extremely difficult to live in and navigate without private vehicles. Raise the Hammer is currently engaged in a project to explore ways that cities might retrofit sprawl to make it livable without cars. We will publish our report in an upcoming issue. I wrote in this report that biodiesel is a net energy sink, and some readers have called me on it, referring to studies that conclude it's actually a net energy gain. Charges and counter-charges of bias abound in the debate, with the pro-biofuels side accusing the anti- side of collusion with oil interests, and the anti- side accusing the pro- side of collusion with agribusiness interests (e.g. the massively subsidized Archer Daniels Midland). In such a heated climate, it's difficult for lay readers to make educated assessments. However, even proponents concede that the energy gain is only modest - say, on the order of 1.3 units recovered for each unit invested. That's a poor ERoEI, and there's no way it's going to be able to scale up to replace the 10/1 ERoEI of petroleum. There's just not enough farmland in the world to feed both people and cars. Dust off your old issues of Mother Earth News and plan on tilling-up your lawn by hand. Food production and distribution is the real issue in all of this. The average table item travels a couple thousand miles on average, and that's after all the energy needed to grow and produce it. The over-all issue will be how quickly the price of energy goes up - currency devaluation and hyperflation possible from other political events may make food costs a serious problem long before the change in the supply of energy has any effect at all. Increased gas costs are causing many U.S. citizens to feel the pinch in their personal finances. Personal earnings and other indicators of economic growth are beginning to show some stagnation, and there is reason to believe it has to do with gas costs. Nationwide gasoline prices are getting closer to record highs from years ago. Individuals are not amused. People are getting installment loans just to fill their gas tanks. Those sites that predict that peak oil will empty our cities are way off base. There's just not enough farmland in the world to feed both people and cars. Food production and distribution is the real issue in all of this. I ain't looking to produce enough food to feed my family of eight (4 humans, 3 cats and a dog) but I can envision a commercial application which may bring in enough extra cash to help in that regard. Alas, I had asked for help here at RTH but none of the great armchair city planners at this site appear interested. Not even the illustrious, industrious Bob Green Innes who has his own rooftop gardens was willing to share his expertise with me. I guess he was just too busy running for MP. No worries, I'll keep you posted on my progress throughout the season and I'm always available Thursday's at Buckeye's. Will the City of Hamilton survive the Energy Crisis? I don't know, but I'll think about IT over a Guinness as I listen to Steve Sinnicks. Very interesting, and though provoking. You definitely are like me, looking deep into the problems that this will cause. I came to a possible conclusion of how the outcome will be. I think before cities completly collapse, you’ll see martial law, and the new executive orders that Bush signed into law being used – giving the govt. complete control over all resources, human, energy, transportation, housing, munipalities, etc. You’ll see a police city-state, crowd busters. It could get bad. Fusion won’t save us. All we have is what is currently available … and unfortunately a few solar panels, wind turbines and other technology probably can’t be scaled up quickly enough to make much impact. But now still people have to take payday loans online in order to pay on gas bills and save the warm in their houses. Seventy percent of the oil consumed in North America is used for transportation... The other thirty percent goes into plastics, asphalt, and other miscellaneous uses. Other miscellaneous uses? I can muse miscellaneous and still stay on track while riding down the curve and then back? Great! So, how can cities survive Peak Oil without the use of or the restricted use of: miscellaneous forms of artificial growth-forcing petro-chemical fertilizers and other assorted ag-conditioners to supply the nutritional needs of their near-famished taxpayers? Mainstream commercial agriculture is not sustainable without petro-chemicals, period! Additionally, as goes the price of oil, so goes the cost of fertilizer that grows food this way. Fuel and fertilizer costs are forcing farmer's into ruinous loss. What is gonna save the day? We all gotta eat you know. Who will tow the plow and who'll sow the row? EH! We will so don't worry about IT now. I am working out all the details this season, alone I guess. No one wants to help me get us outta this mess. Too bashful perhaps? Nevertheless, here are the images I promised at last . I'm still looking forward to your proposed gardening essay! Also, great work analyzing RTH comment scores. A proper data API is still on my to-do list; once it's ready you won't have to scrape and parse HTML to get this kind of information. IT is quite literally in the works Ryan but you know me, I'm a bashful guy. Thanks, a compliment from you is encouraging and inspirational to say the least. A couple things motivated me to crunch RTH data: Openness and Accessibility. That's pretty much RTH in a nutshell. Add another nut and a shell and you can see the results. This is my way of giving back to the RTH community for all the good IT has given to me. Besides that, I felt I owed y'all something for allowing me to hijack this archived article for personal use, where in most close knit groups this is considered abuse. Hello again my friends. I'm way behind with a TracyToob update and IT is practically winter already and I do not wish to disappoint anybody whatsoever. Now if someone in this great innovative city would grant me the elusive money I need, I would have the plants and soil lab-tested for exuded toxicity. Hello!!!??? Can't anyone with some less-sour dough even hear me? Doesn't anyone wish to make bucko money? If I had financial support and could get my hands on the report, I'd rub IT all over Butani, all in good sport of course. I won't hold my breath for a pipe dream however and that's all this is really, even though IT was a complete success as you can see clearly. Now I'm gonna shift gears and ask if our warmer than usual temperatures in southern Ontario have had any affect here, and I have to admit IT probably has. So what of this weather? And what's up with the two professional hurricane forecasters delaying their predictions this past week? I don't know about you, but I prefer Caleb Weatherbee and Professor James McCanney to standard meteorological climatically irresponsible science of the impossible mainstream. In other words, this is how the month of December reads; where each line represent one day and I'm aware I ain't even supposed to be doin' this remember, but... what the hey? Hopefully I won't get busted for copyright violation but I have loved using my Farmer's Almanacs ever since I was a kid, just like my grandparents always did and that's a fact! Anyhow, I noticed on this Friday the 16th - tomorrow - the word Snowmageddon follows and I got to thinkin', if all this rain were snow that prediction would be bang-on you know. Wow, snowmageddon! Damn, looks like Hamilton is gonna dodge another one man. Then again I'm still thinkin', what about Lovejoy? Y'all musta herd of Lovejoy, C/2011 W3? Nothin' much really, just a 200 metre wide comet that's gonna plunge into the sun tonight or tomorrow, maybe with some spectacular sparkling and coronal mass ejaculating or perhaps just a showy starlit passing -- BAR NONE.